Dr. Sheng sees patients on an appointment basis. Dr. Sheng graduated from Shanghai Traditional Medical School, one of the most respected traditional medical schools in China. She studied both Chinese medicine and Western medicine for seven years. After graduation, she taught acupuncture at Shanghai Traditional Medical School as an assistant professor and was a clinical doctor at the Shanghai Research Institute of Acupuncture and Meridians. In 1988, she came to the United States and worked for eight years in medical research at the University of Pennsylvania. Several American scientific journals have published Dr. Sheng’s research papers. Dr. Sheng is one of the very few practitioners of Chinese medicine in the United States who is certified in both acupuncture and herbology. She has 30+ years experience in acupuncture, acupressure and Chinese herbology. 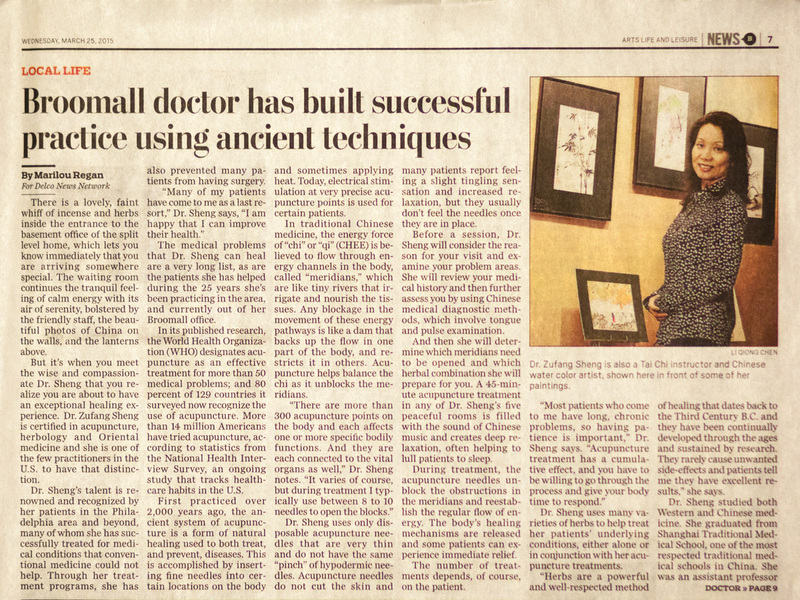 Dr. Sheng has given several seminars about Chinese medicine and has appeared on cable television. She has successfully treated some medical conditions which conventional medicine cannot help and has saved many patients from surgery. She has controlled pain in many people suffering from migraine headaches, low back and neck disorders, tendonitis, bursitis, muscle cramps, arthritis, herniated disc, spinal stenosis, T.M.J., shingles and frozen shoulder. Dr. Sheng has had good results treating patients with Bell’s palsy, sinusitis, bronchitis, asthma, eczema, acne, diarrhea, indigestion, IBS, PMS, menopause syndrome, infertility, prostate problems, fatigue, depression, smoking cessation and supporting treatment for cancer.